Add a decorative touch to the top of your posts. If you’re looking for a post cap with more impact, Deckorators® Victoria Ball Top post caps are an impressive choice. 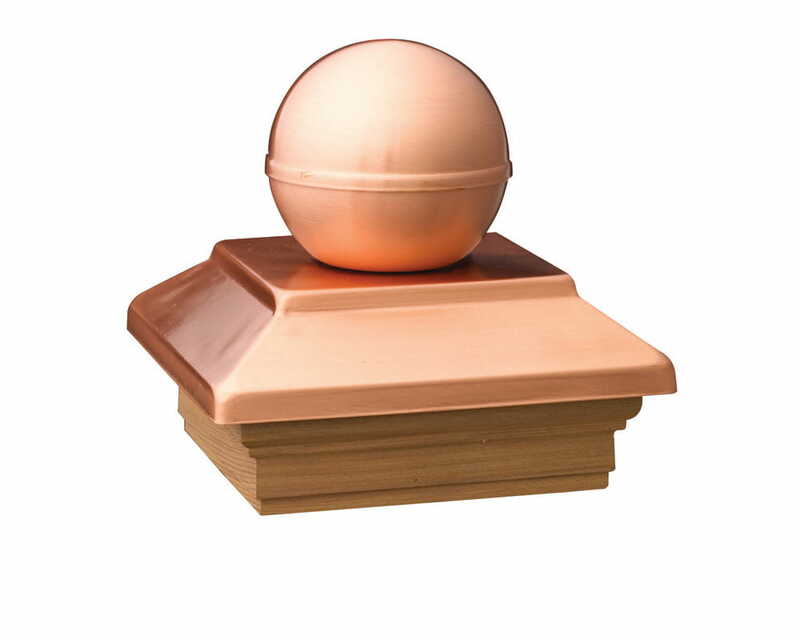 With a copper finish, they add a decorative touch to your deck, fence or porch as well as other projects such as mailboxes and gates. Each post cap is available with a cedar or pressure-treated base. Black is only available in 6" x 6". Our copper finish post caps come with a thin, clear marine lacquer designed to protect them before and during installation. Once exposed to the elements, the sun's ultraviolet rays, moisture and pollution begin to break down this coating, exposing the metal underneath. In its natural state, copper breaks down in the elements and patinas. In general, copper progresses from a natural salmon color to a series of russet browns and grays, and finally to a blue-green or gray-green patina. Powder coating is a dry finishing process in which finely ground particles of pigment and resin are electrostatically charged and sprayed onto an electrically grounded post cap. The charged powder particles adhere to the grounded post cap until they melt and fuse into a smooth coating in the curing oven. The result is a uniform, durable, high-quality finish that is also environmentally friendly. "The lumber industry defines standard wood post sizes as 4x4 or 6x6. The outside dimensions of the standard 4x4 measures 3-1/2" x 3-1/2", and the outside dimensions of the standard 6x6 measures 5-1/2" x 5-1/2".